I’m sure this will come at no surprise, but if you were to ask me what my favorite type of food is I would immediately answer soup. I’m crazy about all kinds of soups, but my favorites stem from my memories of giant pots of Portuguese soups simmering in my Mom’s kitchen when I was a kid. My Mom tells me that my first introduction to solid foods was her soups and I think it’s for this reason that I still crave them today. In fact, there’s not much that I remember from a family trip to Portugal when I was four years old, but the amazing array of soups I feasted on throughout the trip are firmly engrained in my memory (and tastebuds). 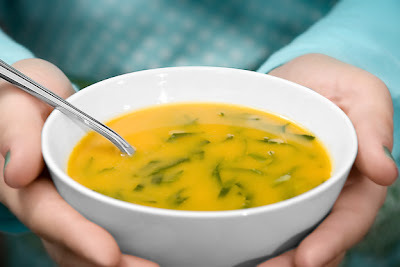 Caldo verde, which translates to “green broth” because it’s loaded with leafy greens, is a classic Portuguese soup originating from the northern region of Portugal. It’s perfect and delicious for its simplicity, traditionally comprised of only four main ingredients: chouriço (Portuguese smoked sausage), potatoes, collard greens (or kale), and olive oil. To this day it’s still one of my favorites. Here’s my vegetarian spin on the classic caldo verde with sweet potatoes used instead of the traditional white potatoes. My main challenge in making this soup vegetarian was replicating the delicious spicy and smoky flavor that the Portuguese chouriço perfumes the broth with. I never shy away from a challenge, however, and as a substitute for the chouriço I first roast the sweet potatoes with many of the same ingredients commonly used in making chouriço, including garlic, wine, red pepper, and paprika. The key ingredient in my version is the smoked paprika; by using it instead of traditional paprika the sweet potatoes take on a smoky flavor nearly identical to that of chouriço (which is smoked during the curing process). Serve this soup with some crusty bread for dunking and it’s hearty enough to make a meal. In a large bowl toss together the sweet potatoes, garlic, salt, black pepper, red pepper flakes, smoked paprika, olive oil, and white wine. Spread onto a rimmed cookie sheet in one layer. Bake for 45 minutes, giving the potatoes a toss every 15 minutes. Meanwhile, chiffonade (cut into very thin strips) the collard greens. To do this stack about 6 collard green leaves on your cutting board. Roll the leaves tightly forming something that resembles a cigar. Using a sharp knife cut across the rolled leaves, producing very fine ribbons. If they are too long to fit on a spoon, you may want to cut them in half lengthwise. Repeat with the remaining collard green leaves. Set aside. Bring the vegetable stock plus 2 quarts of water to a boil in a large soup pot. Add the collard green ribbons and simmer for 15 minutes, or until the greens are tender. Turn off heat. When the sweet potatoes are finished baking transfer them to a blender. Ladle a couple cups of the vegetable broth from the soup pot into the blender. (Note: try to avoid adding any of the collard greens to the blender because this will discolor the broth). Puree the sweet potatoes until smooth. Pour the sweet potato puree into the soup pot and stir well. Add additional salt to taste. Enjoy! I've never had caldo verde. This looks delicious! I love that you've used sweet potatoes too. Oh this really sounds delicious, I will definitely make this! I've never heard of this kind of soup, but it looks good! I think I will try it soon. That has to be one of my favorite Portuguese soups! And, like you, I could live solely on those soups. :) I'm so glad you're sharing veggie versions of these recipes, because I'm trying to transition over completely to vegetarian and everything in Portuguese cooking seems to be based off of that damn chourice! Haha!